Bill Dixon is a British yacht designer who has built a great deal of yachts over the years and has gained a reputation for building well engineered, sea kindly, beautiful looking cruising yachts. This Dixon 46M is ideally suited to a client looking for a stylish and quick yacht built in either Carbon, Aluminium or composite. 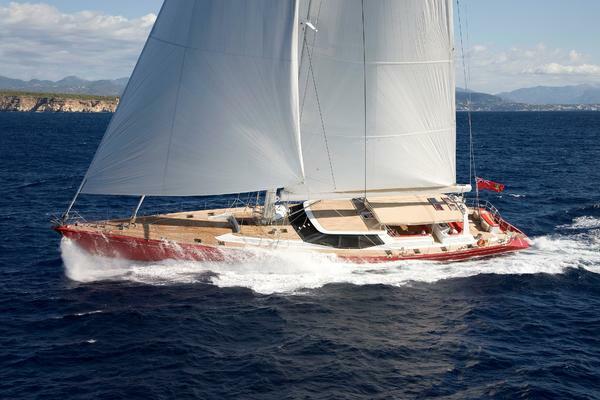 At 46M she is a large sailing yacht and offers incredible deck and interior spaces. There is also room for a high level of customer customisation and tailoring. The 46M sailing yacht is not only beautiful but functional, incredibly well designed and very competitively priced for a new build in Carbon at Alia yachts. We also have plans for this 46M yacht in both Aluminium and in timber composite as options for the buyer to consider. The design brief was very direct; stylish, sleek and powerful. This attractive yacht is packed with some very special design features: • private owners cockpit with retracting concealed Bimini• retracting Bimini over the guest cockpit• two-tone superstructure detailing• retracting side windows offering the guest cockpit shelter from the wind• direct access from the owners cabin onto the bathing platform/beach Her lifting keel coupled to her composite rig will ensure sparkling performance; light on the helm yet responsive. United Yacht Sales New Jersey would love to guide you through a personal showing of this 150' Dixon D 46m 2019. This yacht for sale is located in Unknown Turkey and priced at $19,950,000. For a showing please contact us by filling out the form on this page and we will get back to you shortly!